Read more about onions and the plant to grow them with success in your own garden. Common globe onion is the best known of this aromatic tribe. Spring onions are any variety that is pulled when just beginning to bulb. The tree variety forms a basal bulb, while the flowers are replaced by a cluster of small bulbils that weigh the stalk to the ground, allowing the bulbils to take root. Potato varieties forms a large cluster of plump smallish vegetables at the base. Shallots (eschallots or scallions) form an above ground bulb that splits to form a cluster of bulbs with a delicate flavour. The Chinese varietal is an Asian species cultivated for its crisp textured bulbs, which are popularly used raw, pickled or cooked. Nodding onion is a North American perennial with an intense flavour. Canada onion forms crisp white bulbs and has deliciously onion-scented foliage. Milder flavoured leeks originate from the Mediterranean. Garlic leek is perennial and develops a large basal bulb, which splits into several cloves. Poor man’s leek grows in the same manner as leeks, but has hollow leaves. The plant divides at the base, forming a perennial clump. Ramps form scallion like onion and garlic tasting bulbs. Onions requires a well tilled and weed free soil, good drainage and a sunny position. Plant them by seed. In areas with a short growing season, grow them to the size of bulbils or sets, in their first season, then plant them out to mature in the second season. Regular weeding is essential and do not over water. Harvest globe varieties at any stage. When onions have stopped growing, the tops fall over and wither. Choose a sunny day to pick onions and store in a dry, well ventilated area to prevent fungal rot. Mmm, onions. I’m not a huge fan of the raw version, but hand me a plate of caramelized onions and I will eat them all! I put onions(and garlic) in most everything…much to the disgust of the grandkids. I need to plant these one year! It means never running out of onions! 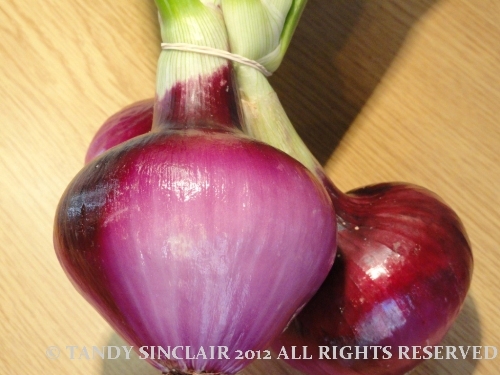 Love onions and always have to have a minimum of 3 in stock – just in case.